Looking for a quick and easy lunch idea? These Low-Carb Mexican Meal Prep Bowls are perfect for taking with you on-the-go! Low-carb, high-protein, gluten-free, and delicious. As busy as most of our lives are these days, sometimes the only way to really stay on track is with meal prep. Especially if you’re out and about during the day! A meal prep lunch like these Low-Carb Mexican Meal Prep Bowls (which are SO easy to make, by the way) can be the perfect solution. Make a big batch of these bowls on a Saturday or Sunday afternoon and have them throughout the week! 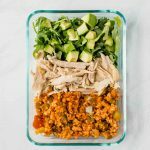 Note: These Low-Carb Mexican Meal Prep Bowls are a variation of our Meal Prep Southwest Chicken Burrito Bowls! The first step is to make the cauliflower rice. For these Low-Carb Mexican Meal Prep Bowls, we used our 30-Minute Mexican Cauliflower Rice Recipe! It’s easy to make and perfect for batch cooking. Pro-tip: Save time by buying pre-made cauliflower rice and simply add in the spices to flavor it! Want to save even more time on groceries for these delicious meal prep bowls? Get an extra 25% OFF your first order + a 30 day free trial membership when you sign up at Thrive Market! There are several options for the chicken. Our favorite option is to use Free Range Organic Chicken from Butcher Box, season and bake it, then shred it or cut it into small pieces and keep it on hand for these meal prep bowls! Another option is to buy a pre-cooked roasted chicken from the grocery store or roast a chicken yourself. Either way, making it once and having it throughout the week is a wonderful way to save time! Related: My honest review of Butcher Box! The salad for this recipe is very simple: arugula and/or kale, avocado, a drizzle of olive oil, and a dash of salt and pepper. So easy! Note: For this Low-Carb Mexican Meal Prep Bowls recipe, you will need to make the 30-Minute Mexican Cauliflower Rice Recipe in advance! Make the Mexican Cauliflower Rice and cook the chicken in advance. When you're ready to meal prep, combine the rice, chicken, and arugula or kale in a meal prep container. Before serving, add in the avocado. *These Low-Carb Mexican Meal Prep Bowls can last about 4 days in the refrigerator. *Each bowl has about 1/4 of a medium sized avocado, but feel free to add more!